Danita Perkins plays a vital role in the care and outcomes of patients and their families at Nash General Hospital in rural Rocky Mount, North Carolina. 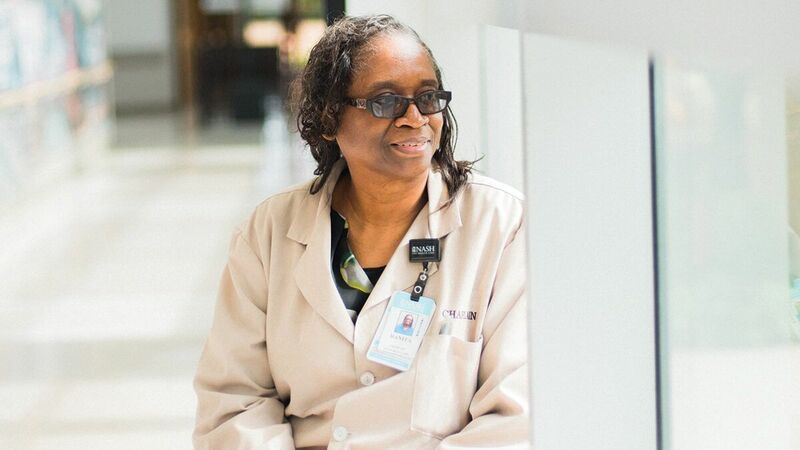 As hospital chaplain at Nash Health Care, Perkins has found her calling being present with people during some of the most emotional and often most devastating moments in their lives. Whether they’re coping with the death of a loved one, dealing with their own diagnosis or simply needing somebody to help guide them through a crisis; Perkins has become an open ear for her community … a shoulder to cry on. “Most people just need someone to bear witness to their struggles,” she says, “without judging them or without telling them how to struggle. It’s about listening with your heart; not trying to fix it, but instead walking alongside them. What most people really want when they come to me is sacred silence. Just being present with people. Being in the fire with them. Letting them know they’re not alone and they will not be abandoned. She found her way to rural health care through Campbell’s Divinity School, earning her Master of Divinity degree in 2001 as a member of the charter class and as the school’s first African-American female graduate. Prior to that, she served six years in the U.S. Army and the Colorado National Guard, served a year in AmeriCorps as a volunteer and was employed for 14 years as a software engineer and computer program analyst. Following Campbell, after a short time in ministry, Perkins took a position as a Clinical Pastoral Education (CPE) supervisor with Martin County Community Action in Williamston. In 2011, she opened a community-based CPE training program for the Ray of Hope Community Development Corporation in Greenville. She joined Nash Health Care in 2014, developing the hospital’s first CPE training program alongside her colleague, the Rev. Richard Joyner. The program and Perkins’ presence are sorely needed in the community, which ranks 65th out of 100 counties in North Carolina in health outcomes — 74th for social and economic factors like education, unemployment, poverty and crime; 70th for lifespan and 63rd for overall quality of life. She and Joyner — who was named one of 10 CNN Heroes in 2015 for starting a community garden in the small town of Conetoe that produced up to 50,000 pounds of vegetables and fruits a year for a community that lacks healthy foods — are building bridges between the hospital and overall community care in Nash County. Joyner’s vision, she says, is to explore how chaplains can have larger roles in discharge planning, transitional care, preventing hospital readmissions, overall health education and discouraging ER visits as a means of primary care. Nash’s CPE training program involves 100 hours of instructional time and 300 hours of clinical ministry, much of which consists of community service. Ministers and clergymen and women have gone through the program, as well as local nurses and other health care professionals. A former professor once told her that it was “through us, with us, by us and even in spite of us that God can draw near to persons. To know this is an inspiration, to feel it is a great joy and to act upon it is our calling.” Perkins says she has taken this quote with her throughout her ministry, and it continues to inspire her today.